Ella Rubinstein has a husband, three teenage children, and a pleasant home. Everything that should make her confident and fulfilled. Yet there is an emptiness at the heart of Ella's life - an emptiness once filled by love. So when Ella reads a manuscript about the thirteenth-century Sufi poet Rumi and Shams of Tabriz, and his forty rules of life and love, her world is turned upside down. She embarks on a journey to meet the mysterious author of this work. It is a quest infused with Sufi mysticism and verse, taking Ella and us into an exotic world where faith and love are heartbreakingly explored. . . 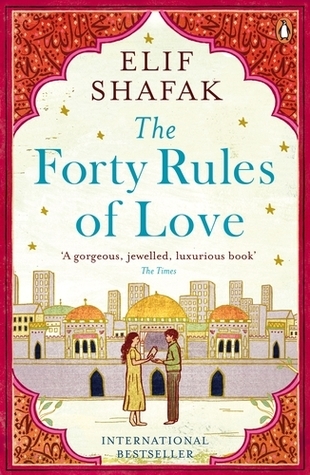 The Forty Rules of Love is beautiful. The book consists of two parallels. One is of Ella, a 40yo woman who has a midlife crisis, stuck in a life where she never experienced love. The other is of Shams of Tabriz and Rumi the famous Islamic poet. The word 'love' in that title is not only meant for the classic boy-girl feelings. It covers everything, from love between man-woman, human-human, father-son, human-God and every single relationship in between. It talks about humanity, God, beliefs and life, giving you thoughts and discussions that will make you stop and ponder your life for awhile. Lets talk about Rumi and Shams of Tabriz. Oh dear God. These two figures were once very much alive people, 2 sunni Muslims who had very strong opinions and discussions about life, death and everything in between. (THEIR DISCUSSIONS AND LOTS OF THINGS THAT SHAMS SAID REALLY OPENED UP MY EYES). I checked and did some reading the Internet to see the validity and to see for myself the real history that went down between these 2 men and i can say their story in The Forty Rules of Love follows almost 80% from the real thing. Shams was a Sufi. You know those dervish in Turkey who wear long white skirts and whirl around while chanting prayers? These two men who the creator of the whirling thing. I didnt know much about Sufism but this book opened up my eyes about the topic. The story about Ella, in the meantime, was.............. i dont know. Can't really say I like the woman and her thoughts or her decision. Plus, I cant really see the correlation between Ella and Sweet Blasphemy other than Aziz. It's like whatever Ella read from SB, didnt impact her one bit. Pretty sure i'll like her better if I got to know her thoughts about SB and see her mind conflicting about it.